"Ma, hat." Mac says pointing to the really cute grey knit cap on the seat next to his carseat, just out of his reach. "No Mac, we're going to leave the hat in the car." Because they say you should never send your kid to daycare with anything you need to get back. And while I don't particularly need this adorable hat that I spent more money on than one should ever spend on a hat for a two year old, I don't really want to loose it either. "Maaaaaa! HAT." You can hear the damnit woman, what did I just say? exasperation in his voice. "No babe, the hat is going night night." That's an almost fail-proof parenting tip for you right there. Don't want your kid to have something (like your hot coffee, mug of wine, or the remote control) tell him that it went night night. He'll be too afraid that he's next to argue. You're welcome. "Maa-aa-aa." His voice is softer now, almost pleading. "Miss Tammy. Hat." There is one tear welling up in the corner of his eye and it occurs to me that he is wanting to show his hat to his favourite daycare teacher. I certainly can't deny the kid that. So hat on head he marches into daycare. No protests about going, no tears. He's on a mission. Miss Tammy is down the hall and he walks right to her. A little smirk makes a brief appearance on his face before he tightens his lip. Cool guy in the making. I might be into you. Y'know, if you are. Whatever. "Nice hat Mac!" Miss Tammy says to him before any other greeting. A proud smile flashes on his face and he's shooing me away as I try to kiss him good-bye. 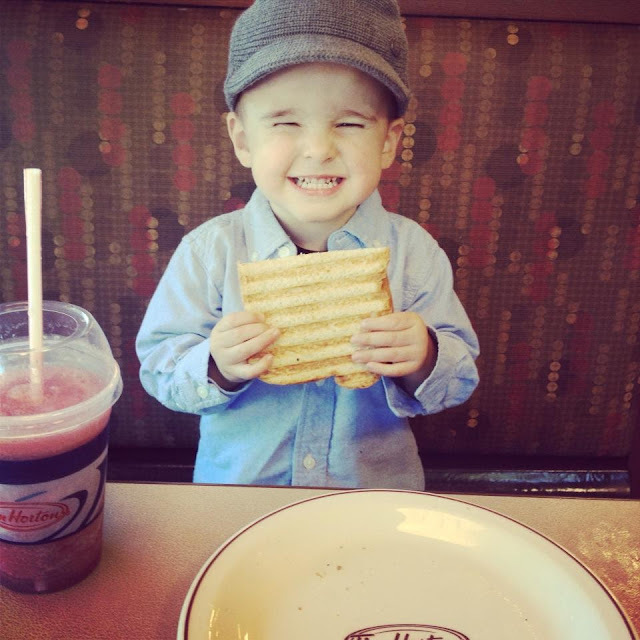 Several hours later Tracy picks him up from daycare and takes him to Tim Hortons. "Did Miss Tammy like your new hat?" She asks him.